It doesn’t take a gemologist to see the 400 acres at the southeast corner of Interstate Highway 10 West and Loop 1604 on San Antonio’s Northwest Side is a diamond in the rough. But it does take a certain vision to imagine what that diamond is going to look like once it’s been cut and polished. Summary: Galo Properties and Fulcrum Development purchased 400 acres at the southeast corner of Interstate Highway 10 West and Loop 1604 for a mixed use development. Timeline: In the spring of 2007, Drake Commercial Group quietly marketed a large tract of land to local developers. A partnership comprised of Galo Properties and Fulcrum Development purchased the tract in June 2007. Brad Galo, chief executive officer of Galo Properties, has that vision. 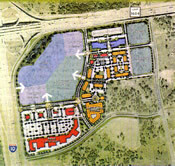 Surrounded by thousands of rooftops; the University of Texas at San Antonio; giant employers like USAA and Valero Energy Corp, and at the intersection of two of San Antonio’s most heavily traveled freeways, 98 acres of the site will soon be joining upscale shopping and leisure developments The Rim, The Shops at La Cantera and The Westin La Cantera Resort as part of what is rapidly becoming San Antonio’s entertainment epicenter. Galo is turning the property into a mixed-use combination of retailers, multi-family housing, offices and hotels to be known as The Landmark. The development plans for the land were stipulated by the former owners, a family from Mexico doing business as Galleria Ventures Ltd. The former owners of the property at I-10 and Loop 1604 wanted to see it developed by local parties. The family had already sold the parcel once. But when Florida-based retail developer Turnberry Associates didn’t follow through on development plans, Bauer was asked to find another—and this time, local—developer. Since purchasing the property Galo has been working with numerous firms to create a master site plan to make sure the parcel is developed to its full potential. Civil engineering firm Bury + Partners is making sure that initial cut results in a quality gem that will stand the test of time. Galo Properties and Fulcrum Development plan a mixed-used project at the comer of I–10 and loop 1604. One of the challenges of developing the property is the fact that part of it sits above the Edwards Aquifer recharge zone. Galo is planning to break ground on phase one of the project in the third quarter. The site is expected to eventually be home to 1.5 million square feet of office space and 400,000 square feet of retail. Busby is also projecting a 35-acre mixed use site combining ground floor retail with an upper level of multi-family housing and office space. Busby adds that Galo Properties is also talking to several hotel operators about building a 200+ room hotel on the site.